Michael Fennelly hasn't lined out for Kilkenny since last August. MICHAEL FENNELLY FACES ‘a race against time’ to return to full fitness ahead of Kilkenny’s crunch opening All-Ireland qualifier tie on Saturday week. Fennelly has not lined out for the Cats since rupturing his Achilles tendon in last year’s All-Ireland semi-final replay against Waterford. 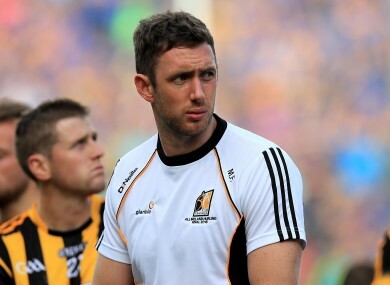 The loss of the three-time All-Star hit Kilkenny hard when they exited the Leinster championship last Saturday week at the hands of Wexford. Fennelly did line out for his club Ballyhale Shamrocks on 20 May in a Kilkenny senior hurling league game but aggravated his Achilles injury since then and is struggling to regain fitness. “I’m just waiting for it to settle down so I can get back training. It’s a setback, but that’s part and parcel of these long injuries. “Anytime you get a long injury, a cruciate or an achilles, normally it kicks off something else, whether that’s a hamstring or a groin. “It’s frustrating because the game is coming up Saturday week. It’s probably a race against time. But, look, I’m just trying to stay positive about it and not think about it. “I just played one (club game), I found it very tough alright. But it was good to get in one and hopefully I was going to progress from there and get three or four more training sessions with Kilkenny. “I think it was the second session after that when it kicked off. It was really positive to get a club game under the belt and play the full game. But, realistically, maybe it would have been better to scale that back a small bit more. For only the second time in his Kilkenny career, Fennelly is entering the minefield of the qualifiers. With the stakes raised for Kilkenny after their Leinster exit, the 2011 Hurler of the Year will be deeply disappointed if he doesn’t partake in championship action this summer. “It is frustrating at the moment, I don’t want my year being over and it’s only starting really. It would be very disappointing if I don’t play any championship this year without a shadow of a doubt. “We’ll see, the D-Day is coming soon in terms of the next qualifier and it’s knock-out so the stakes are higher I suppose. “I’m trying not to think that way. I’m just trying to get myself back into contention to be back hurling basically first of all and then try to get a position on the team. Email “'It's probably a race against time' - Kilkenny talisman battling to return to action for crunch qualifier tie”. Feedback on “'It's probably a race against time' - Kilkenny talisman battling to return to action for crunch qualifier tie”.